Most homeowners who live in cold climates know it's important to 'winterize' the outside faucets to prevent them from freezing, which can destroy the faucet or lead to a burst pipe. The problem is that many people don't quite get it right - winterizing the outside faucets in the fall seems like a simple thing to do, and it seems like it should be straightforward and easy, but there are a few tricks you need to know to make sure all the water is out. Garden hoses - First and foremost, disconnect your garden hose from the outside faucet. If you leave your garden hose attached to the faucet, you're asking for trouble. Frost-free sillcocks with an integral vacuum breaker If you have a properly installed frost-free sillcock with an integral vacuum breaker, you shouldn't have anything to worry about. You should be able to leave the water on to these faucets all year 'round without them freezing. A properly installed frost-free sillcock will have a slight downward pitch, so that when the water is turned off, the water will all drain out of the stem. When frost-free sillcocks aren't installed with this downward pitch, water will sit inside the stem of the sillcock even when it's turned off. The pitch is a little dramatic in the photo below, but you get the point. If this water freezes, it can burst the stem of the sillcock. Most homeowners don't know this has happened until the first time they use their faucet in the spring. Once they turn their faucet on, water starts shooting out of the burst stem inside the house, making a big mess while nobody is inside the house to see it. This recently happened to Connecticut home inspector James Quarello while he was inspecting a home. Better him than me, I say. The fix for an improperly installed frost-free sillcock is to have it re-installed with a slight downward pitch. Winterizing standard sillcocks With a standard sillcock, the water needs to be turned off and drained out to prevent freeze damage. To do this, you'll need to first turn off the water supply to the faucet from inside the house. 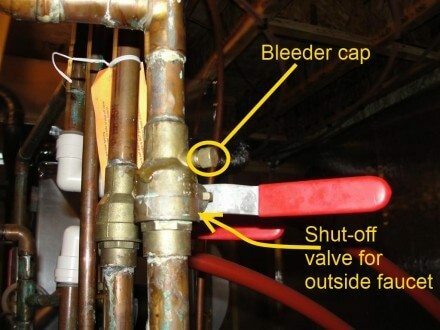 Exterior faucets should have a separate shutoff valve inside the house, but not all of them do. 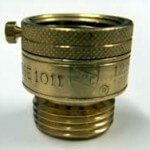 On older homes, these valves are typically located at the ceiling somewhere close to the outside faucet. On newer homes, the valves are typically located right next to the main water valve, and they're also usually labeled. Once the water is turned off inside the house, the outside faucet needs to be opened up. 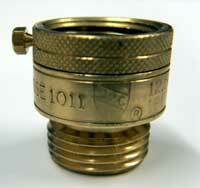 Next, the bleeder cap inside the house needs to be unscrewed - this will allow water to drain out of the pipes. Depending on how the pipe is pitched, the water may drain through the bleeder cap or through the outside faucet. Keep a small bucket handy when you do this, just in case a lot of water needs to drain out of the bleeder. After the water drains out, you can screw the bleeder cap back on and turn off the outside faucet. Sometimes, two wrongs really do make a right Some older houses in Minneapolis and Saint Paul don't have a shutoff valve for the outside faucet, and the faucets never get winterized... yet they never have a problem with freezing. How can this be? 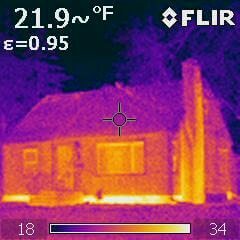 On older houses with no insulation at the rim space, there can be so much heat loss occurring here that the outside faucets never get cold enough to freeze. I call this "two wrongs making a right." It's certainly not a reliable method of preventing freeze damage, but it does seem to work. Vacuum breakers complicate things The problem with external vacuum breakers (aka backflow preventers) is that they don't allow all of the water to drain out. After the water is turned off and appears to have drained out, the rubber seal in the vacuum breaker will still trap enough water to destroy the vacuum breaker, which will cause water to spray out all over the place when the faucet is used again in the spring. There are two possible solutions: remove the vacuum breaker in the fall, or drain the water out of the vacuum breaker. If the vacuum breaker will just unscrew from the sillcock, go ahead and take it off in the fall. The problem with this is that vacuum breakers are often designed to be permanently installed. They have a little set-screw on the side that gets tightened down until it breaks off, making it so the vacuum breaker can't be removed. If your vacuum breaker leaks every time you turn on your faucet and you need to replace it, there is still a way to remove it without destroying your faucet - I made a video showing how to do it. If the vacuum breaker can't be removed or you don't want to hassle with removing it, no problem; there is still a way to drain the rest of the water out. If you look up inside the vacuum breaker, you'll notice that there is a small white plastic post. Just push this post to the side, and the rest of the water will drain out. The video below shows how this works. If the vacuum breaker doesn't have that white post, it may have a plastic ring that will allow it to drain. Great tips - thanks for such a useful post! Wayne & Jean - thanks. I'll be including a link to this post in most of my home inspection reports from now on. The pitch is the reason these sometimes fail. I put the winterizing comment on every single inspection report. This is a fabulous explanation of how to winterize. Great job Reubs! Thanks, Jay. I used to include a diagram of the frost-free vs. standard sillcocks in my reports, along with a reminder to winterize the faucets and some basic instructions, but now I can make it a little simpler with just a link. Interesting post with lots of information. Thanks for the post. Have a great day. Rueben - Great post! I live in Texas, we don't see the extremes as our neighbors up north. But when we receive the occasional cold spell, it's good to have this info. The manufactured housing industy is the only housing industry that requires a "frost free faucet" on all homes manufactured. The rest of the building world needs to catch up on this concept. K.C. - thanks, you too. Ron - Do you guys even have frost-free sillcocks down there? Ginny - I just learned about that little white post myself. I was excited to share the info. Clint - no kidding? I didn't know this was a requirement for manufactured housing. Good info. Good morning Reuben, congratulations on your FEATURED post. Thanks for sharing your valuable information helping homeowners to know how to "winterize" the outside faucets. Excellent post Reuben. I wish you had posted it six weeks ago. This one is a keeper. Thanks for the tip. I never herd of a frost free faucet until now. Reuben, some great tips here and a great reminder. Thanks. Great post and I really appreciate the attention to detail you bring to your professional. It's great to have experts like yourself involved on Active Rain. WOW Reuben, what a great information. We do have big issue with winterization in our area. And it typically shows up when we are ready to sell homes in spring market. Thanks for the post today, I love to get tipw on things like this. Fantastic information Reuben. And timely too for us here in Northern California as we have experienced temps well below freezing the last few nights. I grew up in an area where pipe bursting or freezing was normal back in the day. Now in a milder climate I still do some winterizing but not as extensive as this. You have given a great tutorial I would sure follow if I was in a harsh winter climate again! I am wondering if this is a good argument for using only the type where the vacuum breaker is on the top? Even when completely drained---would not the tinest of leaks at the valve refill the vacuum breaker? Glad I could provide you with a little blog fodder :) Actually the way I saw that little water episode, I discovered a problem for my client. I was in no way responsible for what happened. They should have removed their hoses from the faucets. Good information. We very rarely have freezes here, but the few times we do, we need this information. Reuben, this is another area that many homeowners ignore or simply do not know proper maintenance. Thank you for your good explanation and tips. Keith - they're great, as long as they're installed properly. Ritu - yeah, that's when everyone turns's em back on a finds out they're broken. Charles - Sure... but if you ask me, even the tinest of leaks are unacceptable. You're right though, the integral vacuum breakers are certainly superior. Evelyn - your houses out there probably leak enough heat to make it so nothing ever freezes. Great info. Most people have no idea that they need to take care of these outside faucts. Thanks for putting all of the pictures to go along with this post, Reuben. Living in Colorado we certainly get our share of burst pipes, especially since it was almost sixty yesterday and last night got down to around four degrees. Many neighborhoods put up signs to remind people to turn off and winterize outside as well as in, in case the power goes out. This is a very detailed and informative post, Reuben! The videos are the best! Thanks for taking the time to post this! Very good tips. I can't believe how many people don't disconnect thier hoses in the winter and are surpriesed to heat they should. Thanks for the heads up on this. I never heard of this before. Too late for this year but next year I'll try it. Great advice and excellent plumbing-tech advice. The world has changed a bit since I was a plumber's helper back in the 60's. Best way to avoid pipe freeze? Live in the South. Some day, I will be a snow bird! Maryland isn't too bad, but I do have to protect the pipes. Thanks! Selling real estate in an area that can start freezing in late September and 90% of our residents being seasonal homeowners, we run in to this problem EVERY year. A great explanation and illustration! The post was informative, the presentation outstanding! Congratulations. Thanks for the great information. This will come in handy. Thanks for the info. This type of frost-free was new to me as well. Thank you, Reuben. That was very helpful. Great tip! Not as big of an issue in CA but yesterday we did have cold front blow in. Thanks for the education. Excellent, timely post! I wish more homeowners understood how it works. The majority of HUD home listings in our market have been abandoned and sit through the winter, so most all of them fail a pressure test. Very informative, thanks for the lessons. I got a better solution, move to South Florida. Helpful post Reuben for the snow birds. Good post. I am glad I do not live in the cold. This is very helpful, especially for those who are moving to an area that they have never been in. So that's what happened to that faucet 20 years ago. Thanks for enlightening me! Way over my head (tee hee) but I've bookmarked to share with my hubby & send to my clients as our winter freeze creeps up on us! THANKS! Very helpful information and I loved the simple how-to videos! This is great information almost everyone can use! I'm so grateful to live in sunny Corona, Ca. We freeze very infrequently! I for one have left my hose attached to my faucet all year long on more than one occasion, so I found this post very helpful in explaining a few things.